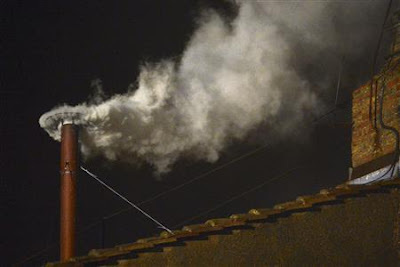 Yimiton's Blog: New Pope is elected as white smoke rises from the Sistine Chapel. "Habemus papam!" New Pope is elected as white smoke rises from the Sistine Chapel. "Habemus papam!" With a puff of white smoke from the chimney of the Sistine Chapel and to the cheers of thousands of rain-soaked faithful, a gathering of Catholic cardinals picked a new pope from among their midst today, Wednesday. The name of the new pope, the 266th pontiff of the Roman Catholic Church, by tradition would not be revealed until he appeared on a balcony on the front of St. Peter's Basilica. "Habemus papam!," members of the crowd shouted in Latin, waving umbrellas and flags. "We have a pope!" "It was like waiting for the birth of a baby, only better, " said a Roman man. A child sitting atop his father's shoulders waved a crucifix.